There is an accumulation of leaves on Malvern Avenue at the corner of Bromley Lane. Please remove. Nextdoor has a current discussion on these requests. The city doesn’t see these here any more. rva311.com is the new service for reporting. There’s an active discussion on Nextdoor about city requests. The city no longer sees these since they moved the service to rva311.com. Bulk pickup info is also on the city website, including phone info to call in pickups outside of the regular schedule. 3 street lights out on Kent Road--one at intersection of 3900 Park; one at the alley opening between Park Ave & W. Franklin St (3900 block) & one at the intersection of Kent Rd and W. Franklin St. Additionally, the light at the East end of the alley that runs between Park Ave and W. Franklin is out. 2 street lights are out on Kent Road. Intersection of W. Franklin & Kent Rd. and across from the alley that runs in the 3900 block of Park and W. Franklin. Also street light out in the alley mentioned above. One of our trash cans was taken and the other one was hit by the garbage truck. I would appreciate a new one. Thank you for submitting this issue, it has been received as service request ID #280759. Are you going to bring the new trash can? Vehicle regularly stored for long periods on sidewalk, blocking public right of way. The owner of 4419 Monument parks his car on top of the sidewalk East of Commonwealth instead of in the street, where there is plenty of space. 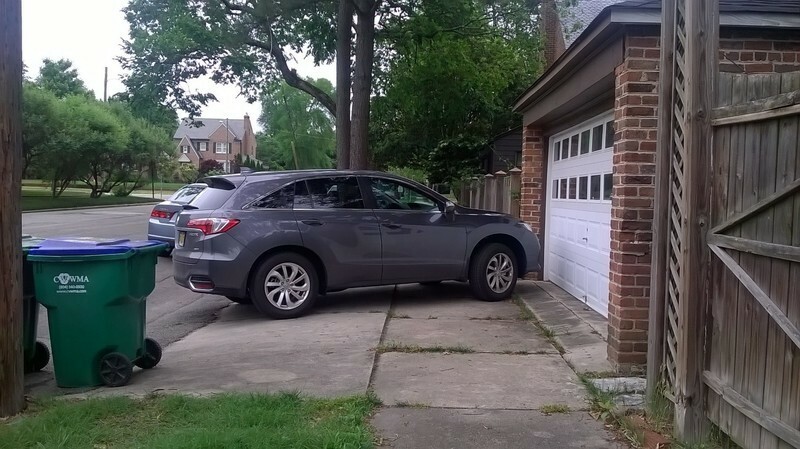 The car is stored there for long periods of time on a daily basis and almost completely blocks the sidewalk. Google Street View from July 2015 shows a red Mini parked on the sidewalk, and my photo from May 16, 2018 shows a gray Acura RDX license 9743TE. His motive could simply be spite, and I hope the City can ticket some politeness into him. Thank you for submitting this issue, it has been received as service request ID #281594. The vehicle continues to be parked on the sidewalk, blocking the public right of way. This photo was taken May 28 around 6:30pm. Can anyone give some advice on how to get this unattended vehicle towed away? Is there a City number to call, or should I just call the police non-emergency line? If it is towed away, what do we have to do to make sure that the owner is also cited by the police for violating City ordinances? The unattended vehicle is still being stored on the sidewalk, interfering with the public easement, as of this morning (June 7) at 7am. Cut limbs and stump from bush in alley. Thank you for submitting this issue, it has been received as service request ID #285684. Thank you for submitting this issue, it has been received as service request ID #285651.